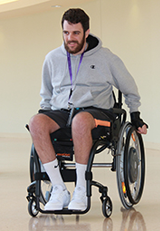 The Marianjoy Spinal Cord Injury Rehabilitation Program provides exceptional, compassionate and individualized treatment plans to spinal cord injury patients and their families. Spinal cord injury can occur through trauma, infection, tumors and stroke. Following a thorough evaluation of the patient's abilities and needs, a team of Marianjoy's expert clinicians develops a comprehensive treatment plan to address the specific effects of the injury and optimize patient performance. We also provide emotional support and counseling for the patient and family; education regarding the condition and resources for post-discharge.